Alaska-Virgin America merger joins very different airlines: Like ‘bacon on a donut’? Alaska Airlines on Wednesday closes its acquisition of Virgin America to become the fifth-largest U.S. airline. Alaska Air Group on Wednesday completed its $4 billion acquisition of San Francisco-based Virgin America to become the fifth-largest U.S. airline. By adding Virgin’s routes out of California to its own dominance out of Seattle, Portland and the state of Alaska, the deal represents a bold move by Seattle-based Alaska Airlines to buy growth. Brad Tilden, Alaska’s CEO, said he’s had “a sleepless night or two” about the challenges ahead in merging operations, but the deal will ensure Alaska can survive and thrive as an independent airline for decades. The merger, announced in April, comes with risk. Alaska must now smoothly combine two airlines with vastly different styles. Virgin marketed itself as a hip, fun boutique airline aiming to disrupt the business of the more traditional legacy carriers, including Alaska. As part of a new marketing blitz launched to promote the combined airline, an Alaska website acknowledges that the two operations make an unusual pairing. It offers some tongue-in-cheek comparisons — “Bacon on a donut. Electricity and guitars. Labradors and poodles.” — to make the point that unexpected combinations can work well. In a push to smoothly merge the disparate cultures among the two sets of employees, Alaska is organizing events to bring the two groups together. However, for the near future, the traveling public will see what look like separate airlines. 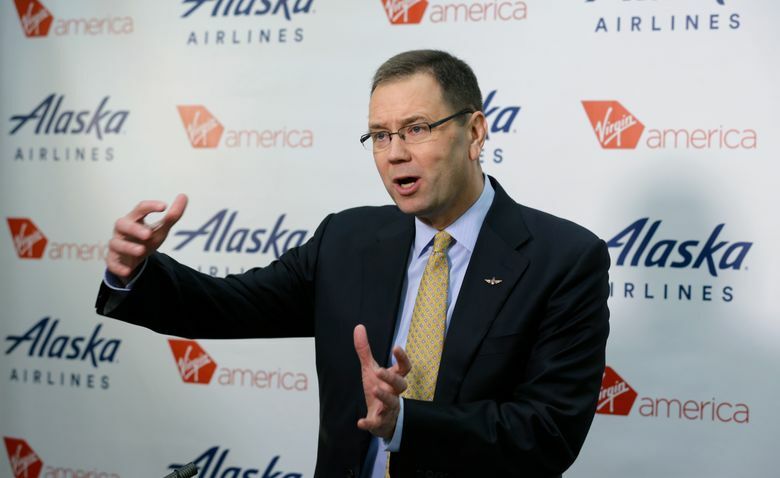 Tilden said management has not decided yet whether Virgin America’s brand will eventually disappear or will continue alongside the Alaska brand. Chief commercial officer Andrew Harrison said Alaska will conduct extensive customer research about what passengers want and make a decision on the brand sometime in the first three months of 2017. Until then, Virgin will continue to operate its fleet of Airbus aircraft under its own brand with no immediate changes to the passenger experience. Whatever Alaska decides about branding, the two airlines cannot technically operate as a single carrier until the Federal Aviation Administration (FAA) certifies that their operations are fully harmonized, including maintenance and flight manuals as well as training, even down to how baggage is checked on each carrier. From Dec. 19, however, travelers will be able to purchase Virgin America tickets at alaskaair.com, and members of Virgin or Alaska frequent-flier programs will accrue points on flights of either airline. Tickets will continue to be available for sale at virgin­america.com. As other airlines consolidated into ever bigger giants — often with major stumbles as mergers such as United/Continental failed to mesh smoothly — Alaska management has until now stuck to its own strategy, developing into an efficient, on-time regional operation and keeping costs firmly in check. But Michael E. Levine, a former top airline executive now on the New York University Law School faculty, said Alaska has run up against the limits of that strategy in terms of raising profits further. “They’ve squeezed most of what they can squeeze out of Seattle and Portland,” he said, so they need to look elsewhere for the earnings growth demanded by the stock market. By adding Virgin America’s much bigger presence at both San Francisco and Los Angeles, the acquisition provides Alaska the bulk to compete along the West Coast against the bigger legacy carriers — American, Delta and United. “We will overnight have the biggest seat share of any airline serving the West Coast,” said Tilden. The merged airline will offer 289 daily flights to 52 destinations from California, including 113 daily nonstop flights to 32 destinations from three Bay Area airports and 105 daily nonstop flights to 37 destinations from four Los Angeles area airports. It will also give Alaska more access to the high-demand East Coast airports in Washington, D.C. and the New York City area. The airline is announcing Wednesday new daily flights from San Francisco to Orlando, Minneapolis and Orange County, Calif., beginning next summer. The finalizing of the acquisition comes a week after the U.S. Justice Department granted antitrust approval. One condition was that Alaska has to limit its future collaboration with American Airlines to avoid reducing competition on routes where Virgin went head to head with American. The loss of some American passenger traffic connecting with Alaska flights will cause a drop in revenue. But Alaska hopes to make up that deficit — which it estimates will cause an initial hit to annual revenue of $15 million to $20 million — by growing its traffic in California. Alaska management projects $50 million in annual savings from getting rid of duplicative functions and $175 million more in added revenue from network growth as a result of the combination. That’s after the one-time costs of integrating the airlines, estimated at $300 million to $350 million. As the deal closes, Alaska is paying $2.6 billion in cash and assumes Virgin’s debt and airplane order commitments valued at another $1.4 billion. The “new Alaska” has nearly 19,000 employees and flies a fleet of 286 airplanes. The disparate fleet consists of 150 Boeing 737s from Alaska, 63 Airbus A320s from Virgin, 53 Bombardier Q-400s at regional subsidiary Horizon and 20 Embraer E-175 regional jets flown by partner SkyWest. Harrison said the combined carrier can allocate those aircraft flexibly to increase revenue. For instance, he said, it may take some Virgin A320s off the high-density transcontinental routes they currently fly into New York and Washington D.C., and replace them with larger 737-900s, while redeploying the A320s on less busy north-south routes. The airline also inherits a Virgin order for 10 of Airbus’ larger A321 jets, with five to be delivered in 2017 and five the year after. “That’s an aircraft we can do a lot with,” said Harrison.